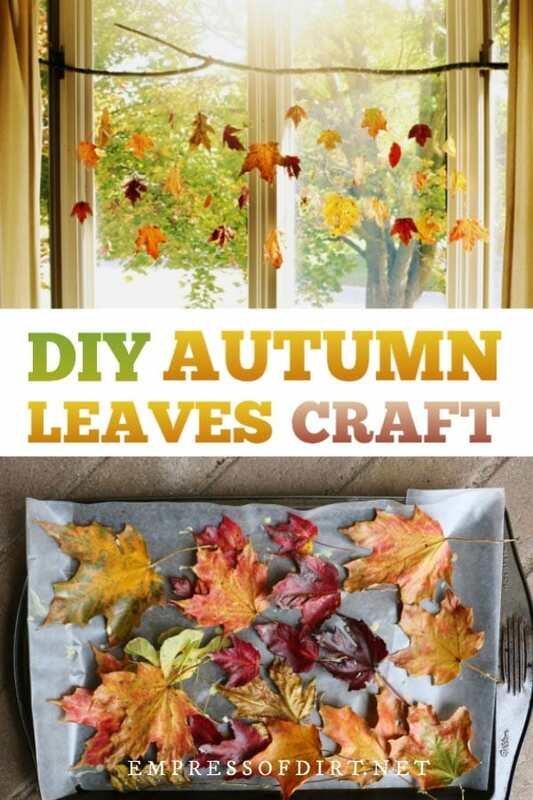 This autumn leaves DIY craft uses real leaves to create a decorative project you can make in an afternoon. See how to naturally preserve the beauty of fall leaf colors—red, orange, yellow, and gold—with one simple ingredient, and artfully display them in your home. 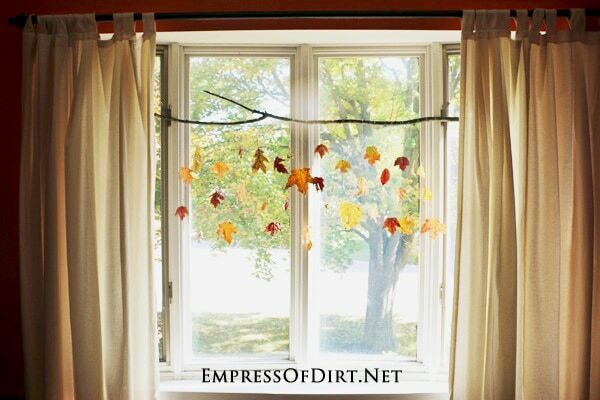 You can also make a glowing autumn leaf project with these instructions. I can find something to love about every season but autumn definitely brings out the delighted collecting squirrel in me. No matter where I go, I find ‘treasures’ I want to bring home. There’s something about the wind and rain, cooler temperatures, and last dramatic bursts of colour throughout the harvest that makes everything peak in beauty. I think it’s a deeply romantic time of year. The same way pebbles on a beach can be so alluring—each one offering a different piece of natural history—no two leaves seem the same. Faced with dozens of must-have favourites, I first started making crafts like this one when I was a kid. If you include the preservation step, the leaves actually maintain their vivid colours and last for months and sometimes years. Basically, the leaves are preserved, suspended from a branch with clear thread, and displayed in a window where the light shines through. I’ll show you how it’s done. The secret ingredient is pure beeswax. And don’t worry. 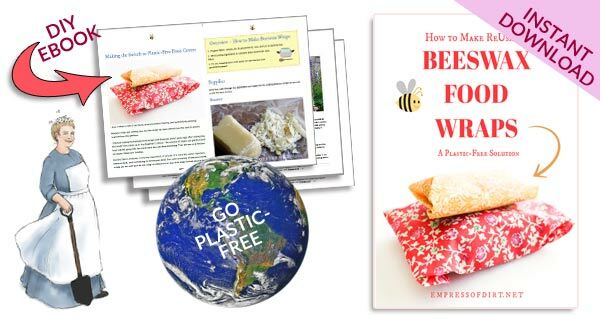 It’s readily available, beautiful, and inexpensive, and once you craft with it, you’ll want to make lots more projects like these beeswax food wraps. Beeswax. For the project you see here, I used approximately 2 ounces (55 grams) of beeswax. 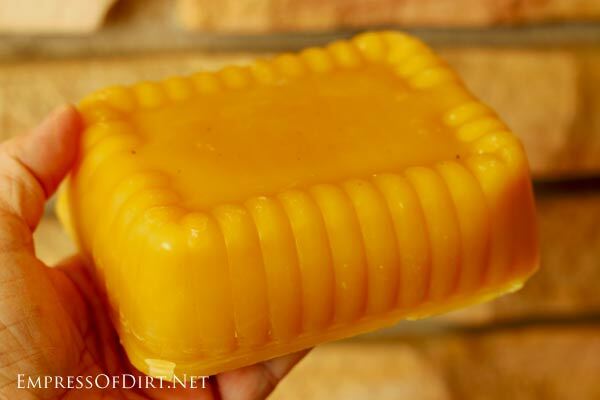 For more beeswax sources and project ideas, see Creative & Practical Beeswax Project Ideas. Heat-proof bowl or old pot (dedicated to crafts only) plus a cooking pot for boiling water. You’ll be creating a double boiler. Beeswax for crafts comes in blocks or pellets, natural yellow or white, purified (natural debris is filtered out) or natural. I use the basic natural yellow beeswax in block form. Here (Ontario, Canada) I get 1lb (16 ounce / 450 gram) blocks for $6 each. At room temperature, beeswax can be fairly difficult to cut into pieces, which is why pellets are handy. You don’t have to cut them up and they melt rapidly. a) Place beeswax in the freezer for a day (in a heavy duty freezer bag) and then smash it with a hammer to break it into bits. b) Alternately, you can also heat the blade of a good cutting knife and slice it that way. 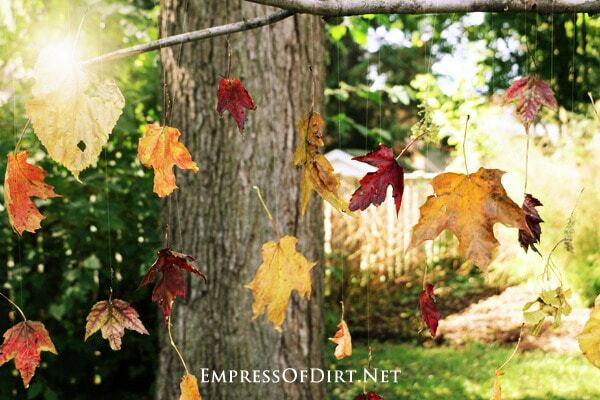 Collect freshly fallen leaves—the fresher the better, sprigs of wildflowers, maple keys. Allow to dry between sheets of newspaper for 1 day. Put books on top if you want them flat. Do not dry them longer than a day or they start to lose their colour. Supplies: dried leaves (etc. ), tweezers, double boiler, 2 ounces (55 grams) beeswax, wax paper on a cookie sheet or tray. Set up a double boiler: I placed a heat-proof glass bowl on top of small metal measuring cup in a pot of water. Bring water to boil, careful to melt beeswax but not boil it. You just want it to turn to liquid and not get any hotter. Here’s the finished branch. You can see that it looks sweet as it is but you could also use about 2x as many leaves and have much longer sections as well. Dip leaves in melted wax one at a time. It takes just seconds to cover the entire leaf and stem. 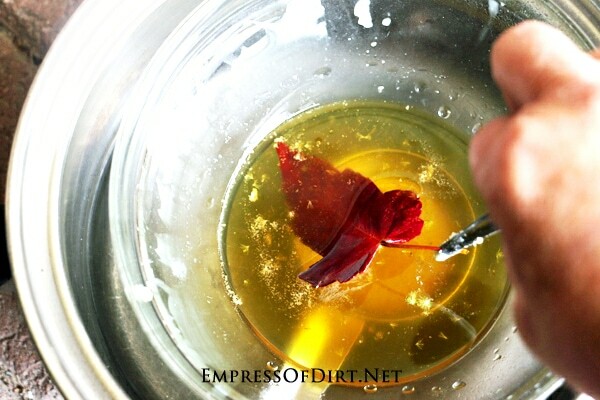 After coating in wax, gently raise the leaf to allow any excess wax to drip back into the bowl. 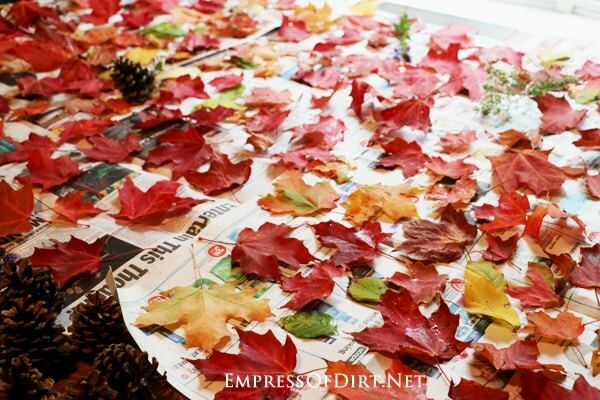 Place each leaf on the wax paper while it dries. They dry really quickly. 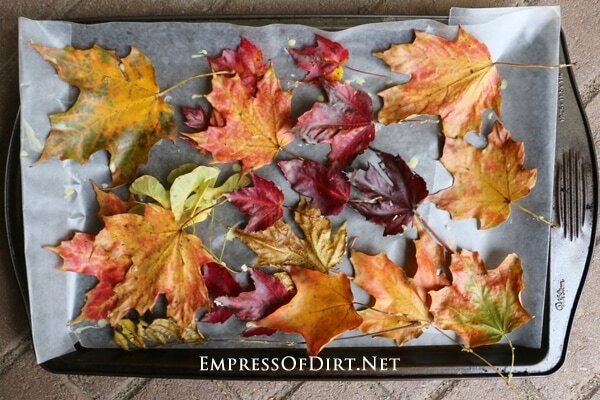 When the leaves are cool, you can re-dip them if you want a thicker coating. Test one first though to make sure you like how it looks. I like two coats for better longevity. Supplies: wax-coated leaves (etc. 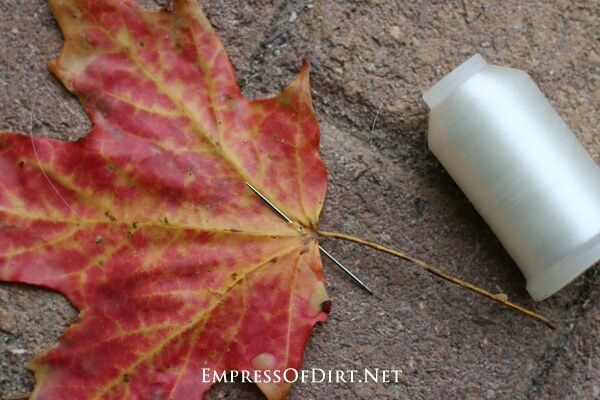 ), clear thread, needle, branch, hot glue gun. Tip: It’s easiest if you can do this step with your branch secured in front of you with enough room for the hanging leaves. I suspended mine between two barstools while working. To hang the leaves, attach clear thread to the leaf (thread and tie a knot) and secure the other end to the branch (with hot glue). Be sure to place your hot glue on a part of the branch that won’t be seen. Use a needle to make a small hole in the leaf (near the stem or in the top of the stem if it’s thick enough), thread the clear thread through, and secure it with a knot. Alternately, you could also secure the leaf to the thread with a dab of hot glue. Place the top end of the thread on the branch and secure it in place with hot glue. It should dry and securely hold the leaf after about 10 seconds. Snip off any surplus thread ends (from tying the knot). Alternate the length of thread and sizes and colours of leaves to make it interesting. When ready, hang the whole thing up and admire your craftiness. While I wouldn’t want it in strong wind, this falling leaves mobile would also look good on a covered patio, with the leaves twirling in the breeze. If you’re a leaf fanatic like me, I hope you’ll give it a try. Beeswax is lovely to work with and the end result is a favourite in our house throughout the season. Do you think beeswax would work differently than paraffin? And how long do the colors of your leaves last? Hi Elizabeth, Good question. I have not tested paraffin wax simply because it is derived from petroleum products and not something I want to use. I’ve had the beeswax leaves for several years without any change in appearance. I do not know if they would fade if kept in a full sun location though. I have no info on whether beeswax is suitable for long-term preservation. Never would have thought about beeswax. 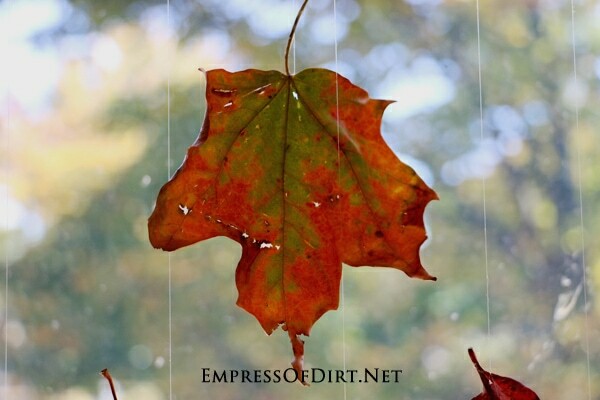 On my list of things to start soon is an art journal of leaves from native trees in our area in south central Missouri. Too late for the autumn leaves but in the spring when I pick the green leaves I’m thinking I could do a page with them – dip the green ones, and then in the autumn go out and find the same leaf to match the green one, dip it and put on the opposite page. I actually started a few pages a month ago when the leaves were turning, but changed my mind on the format so the project has been tabled until spring. Something to look forward to! Sounds like a lovely project! Let me know if you try the beeswax idea. I’m not sure if you’ll find the dipped leaves a bit bulky for book, but worth a try. Will the beeswax melt if the leaves are hung outside? No, the melting point (temperature) for beeswax is 144 °F (62 °C), so it’s not an issue. I buy it at a local farm that makes honey. It’s very inexpensive. Perhaps there is one where you live? Some offer mail-order too. Gave a shout out to you on my blog, because you inspired me to do my own craft! Thanks for sharing your craftiness and love of Fall! 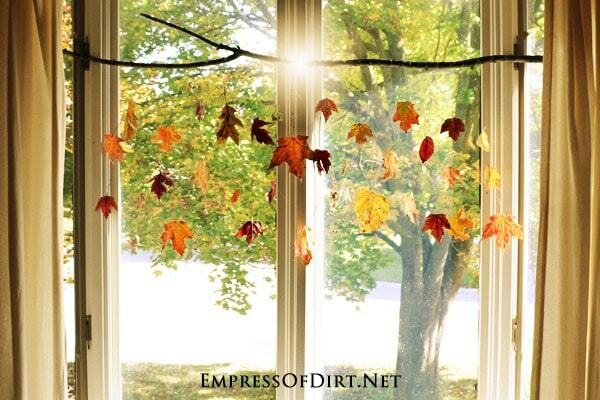 Leaves are so beautiful in the Fall and now with this idea i will be able to preserve them,thanks. Looks like we’re both love working with leaves right now. I love this idea and preserving them in the beeswax is brilliant.